March is a marathon! 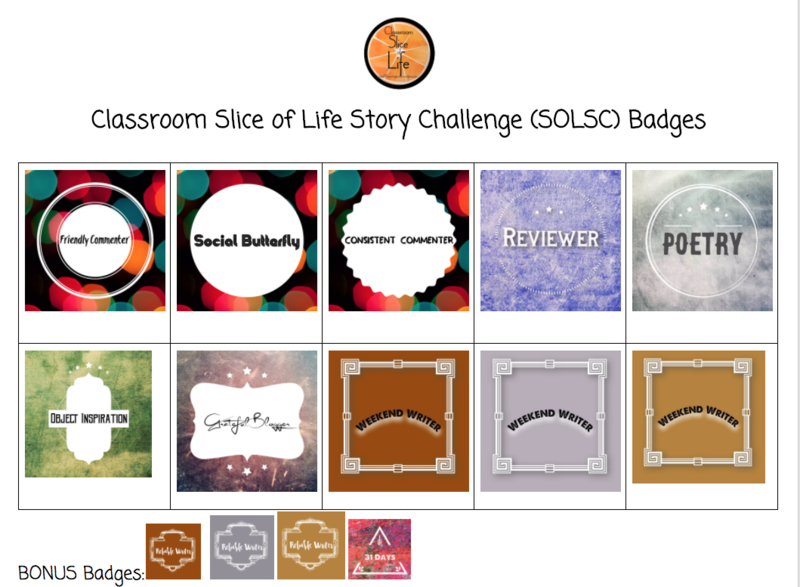 Educators who take on the Slice of Life Story Challenge (SOLSC) commit to 31 days of blogging, reading, and commenting on other blog posts. Educators who take on the Classroom SOLSC add a whole other layer to the challenge: Not only are they blogging and commenting themselves, they also set their students up to blog for 31 days, facilitate and encourage student blogging, and help connect their students to other classroom blogs. This was my third year in the Classroom SOLSC and it is hard work yet rewarding! This year, our Spring Break began on March 29th, so the students finished out the challenge on their own. School resumes today, April 6th and my students and I will celebrate the end of the challenge together. At the start of the challenge, I shared a digital newsletter with parents to explain what it was all about. I also explained my badge reward system to parents here so they knew at the start of the challenge how students could earn a certificate and prizes. Students who earned 5 badges will get a Certificate of Participation. Students with 7 more more badges will be able to pick a prize from the basket I put together. The prizes include markers, journals, and new books. 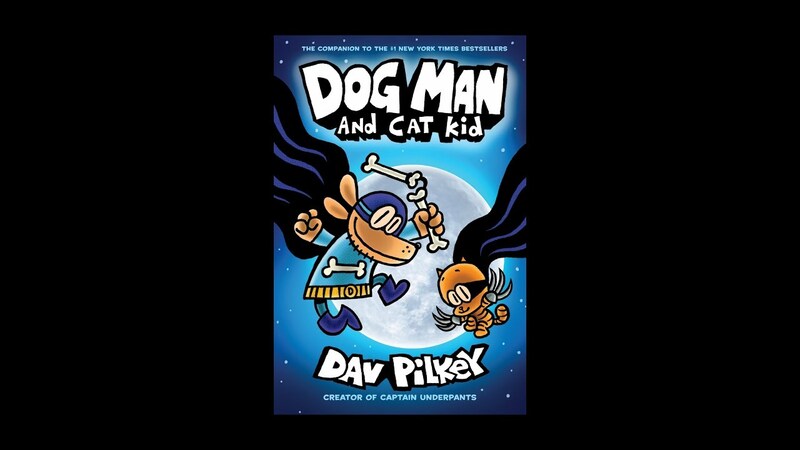 Dog Man and Cat Kid is one of the books students can select as a prize. I plan to ask the students to reflect on the Classroom SOLSC experience. If they blogged more this month, how did that go? Was it easy to find topics? Were the comments motivating? What was the best part of the experience? If they did not blog more and did not take part in the challenge, how come? I gave students some time in school to blog but also included paper in their packet in case technology was an issue at home. One of my students who blogged every day did it via paper. Everyone had the opportunity to participate and be part of the challenge, but many chose not to try to earn badges. I wonder why and will be interested to know their responses. We went into the challenge this year blogging less than we had in previous years. In previous years, I dedicated one period a week to blogging. This year, our third grade schedule changed with two period of Innovation Lab every week and Math Inquiry Lab every other week. There was less time dedicated to blogging. The challenge definitely brought new life and enthusiasm back to blogging. I still battle with myself over student conventions. Some students are not punctuating at all when blogging. I debate what to do because I want them to have ownership over their blogs and I don’t want it to feel like a school assignment. I don’t know why kids stop punctuating sentences sometimes when blogging and what the best way is to address this. Should I be more of a presence on our class blog page? In March, I’m writing my own posts on my personal blog, I’m taking on responsibilities for the Two Writing Teachers during the challenge, I’m reading and commenting on educator and student blog posts….it’s also my daughter’s birthday in March and report cards. I physically don’t think I can do more in March. Maybe in February I could draft some posts and then publish them in March so kids see me on the blog more. Do other teachers post often on their class blog? Only a couple of parents left comments on the blogs. Should I host a meeting to explain the challenge and get parents involved? Make a screencast to explain how to comment? One of my badges was for writing a review. Kids had no idea what this even was! I would love to teach a unit on writing reviews. But where do I fit this into my curriculum when that’s not a unit of study I’m required to teach and I can barely find the time to teach the required units? Is there a way to better marry my personal narrative writing unit with blogging? Students didn’t often use what we learned about personal narratives when writing their Slice of Life stories. Kids often write their blogs as if they are talking on a video….is that something to encourage or discourage? How can I encourage my students to have a wider authentic audience when the challenge ends? Should I reach out to other classes in the Classroom SOLSC to try for a longer-lasting partnership? 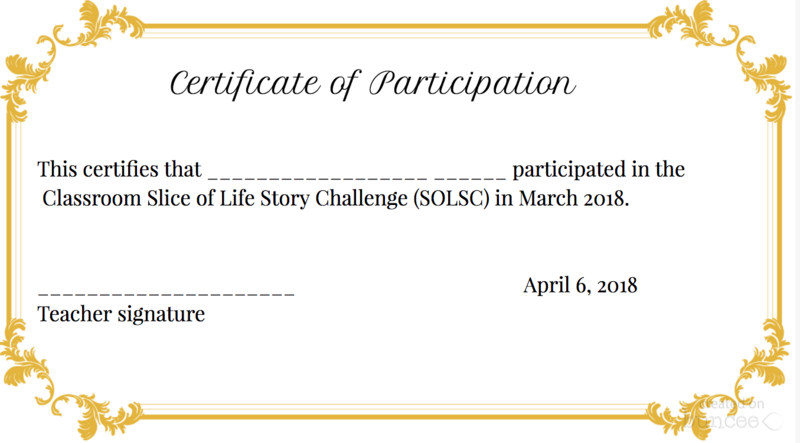 Kathleen, I have had my students participate in SOLSC for 5 years and each year I think, “I’m not doing this again” and it is one of the things my former students ask about most often. I think your badge idea is great. I’ve used candy and unique writing tools as motivators along the way. Badges are more affordable! I wish I had the answer to why don’t students proofread before posting, this same lack of revision exists in our notebook versions of the challenge. I am often torn trying to determine what level of effort is needed to “count” for the day. The years that I have been present on a blog with both my own posts and commenting for each and every student my students have made the the largest gains as writers. It was exhausting and so this year, with my 2nd grade class, I just had notebooks. Though it was easier and less public (How do I let families think some of those posts are okay?) the writing was not the same level. One year I had a kickoff event with families. We made notebooks, wrote an entry and shared with one another. Most students had someone there to hear the expectations as well as gain a better understanding of the expectations. I think the overall goal is to grow writers and even though it is a challenge for the teacher as well as the students, next year I plan to go back to blogging. Thank you for your thoughtful comments! I love the idea of a family kickoff with notebooks! What a fantastic idea!! Thanks for sharing! I love the idea of them nominating one another! I am blessed to have a class full of writers this year. However, while their posts are creative, many of them are missing punctuation and, it is obvious, never proofread. In the past my students wrote very little and often about the same thing over and over. This year we spent lots of time the two weeks before the challenge brainstorming ideas for our posts. We also practiced elaboration with everything we wrote. I showed them my personal blog and explained my thinking for topic choice. Then we chose a couple topics from just looking around our classroom and practiced elaborating with practice posts. I think that practice helped define what was expected during the challenge. I ended up with eight out of 26 who blogged all 31 days. Yay! They also did pretty well on their commenting, although some wrote the bare minimum. They really loved the comments they got from other classes. Next year I’m going to try to focus more on proofreading. Thanks to TwoWritingTeachers for allowing my students to explore writing for an outside audience. Oh, Kathleen, so much to do and never enough time . . . I’ve often thought that SOLSC should be in February (fewer days and fewer breaks to manage). That said, I have to share my blog post from the first year that I started blogging and had my students participating too. I was trying to figure out how to have students reflect on the process and Dana saved the day for me (see her suggestions in the comments on the post). I so love and appreciate our community of writers!